Download the PDF below for a 10 step guide to writing a post. Feel free to use this with your students. Scroll down for further step-by-step instructions and videos. 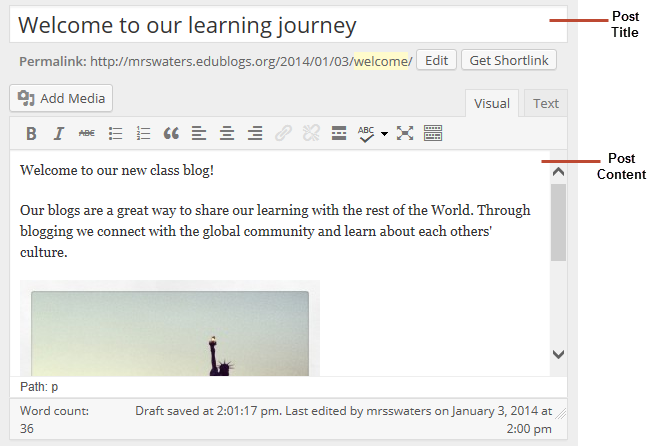 Your posts are where you’ll publish your main content such as what’s been happening in class. assignment information, homework, documents, and more. Learn more about posts and ideas for writing posts here. 2. Give your post a title and add your content. 3. 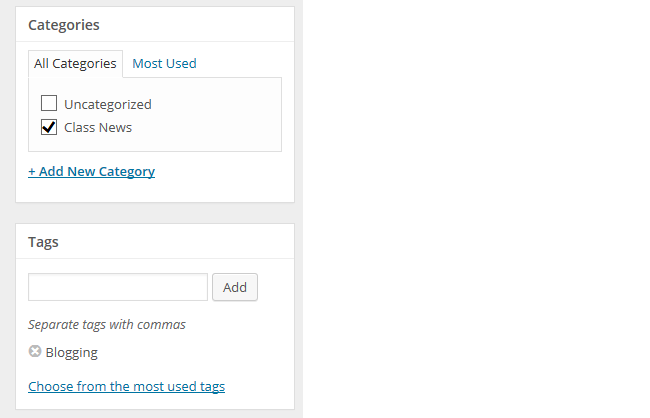 Add your tags and categories. 4. When you have finished writing click Publish or Submit for Review. The area where you write your post is by default in Visual Editing mode which uses WYSIWYG (What You See Is What You Get) option for formating. Simply write your post, highlight any text you want to format and then click the appropriate icon in the toolbar to add formatting such as bold, italics, number list. You preview a post by clicking on Save Draft and then Preview. This opens up a draft version of your post in a new tab. To make edits just go back to your Add New Post screen.